In what might be called a very modern way, I discovered this poem through a film. 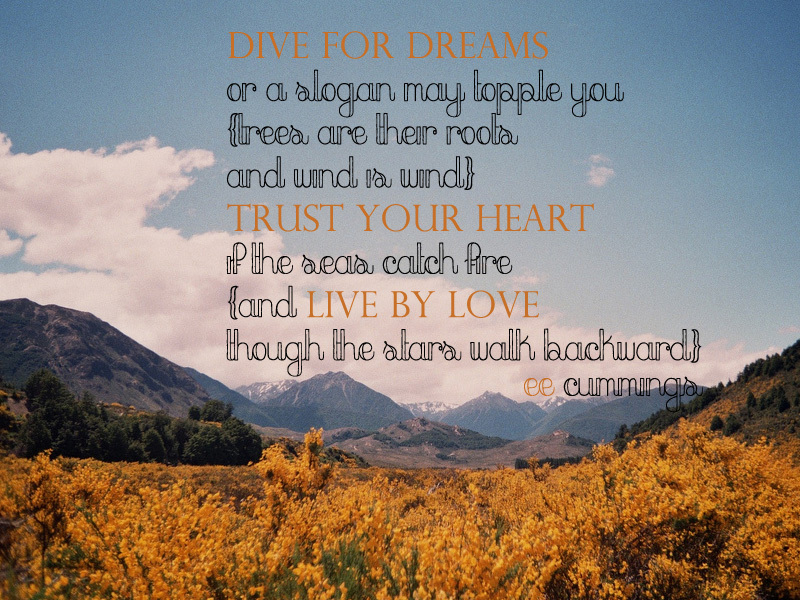 It is recited in Charlie St Cloud and I love how inspiring it is. A modern film using poetry is pretty rare these days. In fact, we seem to rarely discuss poetry at all. So, is it still relevant? I should say that I do not consider myself a poetry expert at all. Occasionally, a poem pops into my head and I share them on this blog, I also see poems pop up on some of my favourite blogs sometimes and we all seem to write them to capture a particular moment or feeling we are having. Sometimes a poem seems to be the best (and only) way to describe something and writing it out helps either quell the feeling or make sure you remember it. Poems feel more emotional to me than just writing in prose. However, I rarely read poems for pleasure. I have a book of poetry in the house but most of the poems in it are REALLY old, ones that we had to read in school and even though they cover the big themes like death and love and everything in between, they are mostly from a time far removed from our own. At the big celebrations in our lives – marriage or funerals, poems are reeled out but again, they are mostly what we know as “the classics”. A time when language and emotion were treasured. When poems were not only relevant but romantic. And were a way for people to communicate. I suspect only a few people could recite a modern poem. Poems seem to have slipped out of our consciousness as time has moved on, in a way that books have not. I think it’s a shame that poems don’t seem to be revered in the same way today. I think they can have relevance to us. Poems can still stir emotions and capture moments and feelings in a simple and concise way that literature cannot. Perhaps schools play a part in this and should explore more than “the classics” and encourage people to write them. I suspect National Poetry Day won’t make a mark on much of the population but hopefully it will spur some people to pick up a poem that they wouldn’t usually and discover the treasure within. Is poetry relevant to you? Previous postIf it was that easy, everyone would be doing it. It is a shame. Poetry is important. It has documented the human experience for longer, and often more concisely, than any other form of expression (although a case could be made for drawing). The nice thing about poetry, however, is that it ages well. It endures. The ancient words of Sun Tzu, for example, or the more recent Rumi, are still profound teachings. They have outlasted and outshone their contemporary works of fiction. It may be small consolation for the starving poet, but will anyone be talking about Harry Potter in seven hundred years (should we last that long)? And the poets are tragically overlooked in their time. Because they are ahead of the curve. Many people these days are enthralled with video games or motion pictures, but it does not take long for these to become dated. Sure, there were some fine films made in the 1950’s, but they have lost their lustre, their prime attraction, that is the novelty of their newness. Apologies, I sort of went on a tangent. Thanks for an engaging post. This discussion is important. I think you’re right – the classics are classics because they are still are relevant – what they talk about is timeless, I’d just like to see modern poetry given more of an airing as it could be a classic of the future. What’s funny is a lot of what we deem to be a classic now, didn’t do that well when it was released so who knows what will be thought important in the future? Thanks for commenting and following! I rarely memorize poetry, but I do have favorite poems. Poetry touches me deeply. Perhaps it;s the combination of emotion and cadence that resonates with me. Poetry reaches the soul in a way other words fail. I like the way you see it, and of course you write it beautifully too! I never really understood poetry until I started attending local poetry readings. The poets bring such life to the words. Listening to poetry is like listening to music, and it can be a very emotional experience. I also love writing poetry to capture a particular moment, like you said. Prose just doesn’t cut it sometimes! I’ve never been to a reading, sounds interesting! Yay – hope you enjoy! I love a bit of poetry. I particularly like it when you can connect with and understand the poem and when it relates to you. Yes, it is lovely when that happens! People are still really connected to music, and the lyrics of most songs can be considered poetry. However, there are also those songs that sound completely ridiculous if you were to read out the lyrics like a poem, and the singer doesn’t even deliver the words very well because he/she is auto-tuned in the recording studio and everything. And there are those people who write greeting cards for a living, haha! But it does feel like poetry is kind of dying out…I definitely don’t know anyone who is a poet for a living. I agree -songs are often poem-like, you could even argue rap is a modern type of poetry. I’m not sure if you can make a living just out of being a poet but UK still has a poet laureate! I think there are good modern poets out there but as a medium it has been cast into shadow by pop and rock music, also great in their own way of course. To write a good poem is to suspend a thought or mood precisely in words, each chosen for clarity and resonance. when you come across a good poem it is like straying into a secret garden and being lost in the wonder of it. Poetry has always been relevant to me. It seems like song lyrics (a type of poetry) are more relevant to most of society these days, and in a way, that’s kind of a shame. I think it’s great you love poetry. I think some songs are worth that love but others fall way too short. I’ve always loved poetry. Written it since being small. There was an ancient book of poetry on the shelf which I used to pour over with some old poems in which gave me the rhythm and rhyme I loved so much. I do think most people have poetry torn out of them by English Lit. at school. Analysis of a poem is usually death to a poem. But it is a rare child that doesn’t like verse. It’s a shame that it is taken away from them. I actually think that’s pretty terrible anyway! Couple of memorable lines and the rest is too dull for words. Long poems have to be really good to survive. Don’t think that one qualifies. I enjoyed this post. As someone who tries to write a couple a month purely for the pleasure of seeing what I can come up with and how language can be used it has always been relevant to me. I think it is a pity that it does appear to be sidelined but I accept that is the way of modern culture. I will keep putting them out regardless as it’s fun to do. I was lucky at school because my English teacher was a huge fan of Sylvia Plath and I studied her work and that started my interest. Lyrics are also a huge part of my life and I agree with the point you make that for example rap can be viewed as poetry. I like to treat it all as simply writing rather than poems or lyrics. Thanks! Great to hear you had a teacher on board and you’re right – writing is writing and we should appreciate and celebrate all forms. Sorry, I have come late to this thread, but I’m here now so I shall begin. I think, whatever we write, it is always about the words. I have read wonderful poetic prose, with a great or bad story behind it. For me, poetry is about the idea, about the sound and way words are used, but mainly about taking an idea we can relate to in some way and explaining or describing it in some way. In the UK at least, there is a deeper undercurrent of poetry meetings, groups and writers than might be first thought. Even without the help of major bookshops many small publishers are printing books and pamphlets and distributing them through word of mouth, festivals and readings. I recently went to some of the Bristol Poetry Can readings met the writers and bought the books. The Poetry Society has started to change the London-centric poetry scene by working with local members around the country to spread the word. Many people turn to poetry still in times of joy and crises, find the words to help them express feelings that might otherwise be held back. I find writing poetry more natural than longer work, perhaps because of the way my mind works, who knows. Writing prose is like pulling teeth for me, although I am writing my travel notes on my blog – as a way of writing each day – I write short stories sometimes, not often, usually while I am waiting on a piece of poetry to form itself in my mind. Any kind of writing can help with literacy and sometimes shorter ideas can be expressed by people who would not normally attempt to write. It can give them confidence to speak when other means have not worked. So, coming back, yes poetry has relevance in my mind to everyone, even if it only in an advert that makes them smile. There is so much good writing out there that we all must choose to find it, using whatever means. We must not allow marketing to dictate what we read, or what we buy. And we should always look after good writing.